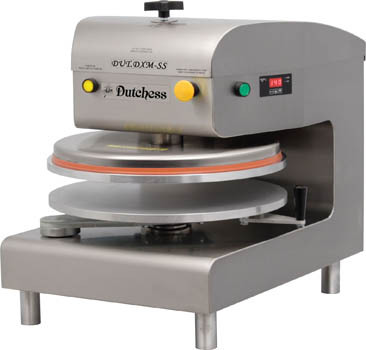 DUT/DXE-SS Automatic Electric Pizza Press -- Dutchess Bakers Machinery Co. Inc. The Model DUT/DXE-SS electric stainless steel Pizza Press is the most efficient, durable and easiest way to press Pizza dough. With the large 18" heated top platen you can warm press, cold press pizza crust in seconds. The lightweight bottom platen easily swings out to allow you to quickly load and unload product. Easy-to -use digital temperature readout with countdown timer - resets after platen raises. Bottom platen swings out saving space and easier to use than top swinging models. Two start buttons for hands free operation. Sleek, Modern, Durable and easy to clean all Stainless Steel design. Optional non-stick coated upper & lower	platens. 120 volt, 1200 watts, 10 amps.